Being aware of how much caffeine you consume daily is important, because understanding how caffeine affects your brain and natural energy processes can make a difference. If you’ve ever wondered why you keep going back for cup after cup of coffee, it may be because you’re drinking coffee at the wrong time. Your body has a natural process of waking you up in the morning and giving you the necessary energy throughout the day. The Food and Drug Administration has been studying caffeine consumption since 1978, when there was a heightened popularity of cola beverages. Even now, studies done by the FDA continue to focus on current levels and the pharmacological effects they have. The FDA considers a limit of 400 mg, equal to about four or five cups of coffee, a safe amount of daily caffeine. Consuming more than four or five cups can have a notable impact on your brain. Adenosine is a chemical that is produced in your brain to give you an increasingly calming or relaxed feeling throughout the day. The longer you’re awake, the more adenosine adds up and the more fatigued you become. Caffeine, with a similar chemical makeup to adenosine, replaces and counteracts these feelings of fatigue. You don’t have to stop eating or drinking caffeinated products, but, as with anything you put in your body, you should know what you’re consuming and how much. Many studies have concluded that coffee is not bad for you. Millions of people have been involved in caffeine studies, and results have shown those who consume three to five cups a day or a moderate amount are at a lower risk of health problems. Caffeine may have health benefits that include protecting against Parkinson's disease, type 2 diabetes, liver disease and liver cancer. Coffee research also shows improvement of cognitive function and a decreased risk of depression. However, your brain, once it is accustomed to having a daily dose and increased productivity and focus, develops a dependence on caffeine. Wake Forest University researcher Paul Laurienti shared how people without their usual fix had low visual and auditory activity. Therefore, people who have a substantial dose daily needed it to function normally. With that being said, many caffeine regulars are using too much, because levels of activity are at average only after caffeine has been consumed. Though caffeine isn’t something to be fearful of, it is a drug, and long-term use causes your brain to develop a drug dependence. Therefore, if you try to stop drinking your usual amount of caffeine, your brain undergoes withdrawal symptoms. Some other results of long-term use can be an increase of adrenaline and a dopamine stimulation. Again, studies show these aren’t completely negative, but they are signs and issues to be aware of. After waking, wait before consuming caffeinated products. This may seem odd, but according to Steven Miller, a Ph.D. candidate at the Uniformed Services University of the Health Sciences in Bethesda, Maryland, in an article called “The best time for your coffee,” people have a natural cycle for when the body releases energy. Each body has a certain regulating 24-hour circadian clock, which controls sleep-wake cycles, feeding and energy consumption. Cortisol is a steroid-based hormone that regulates metabolism and stress within your body. According to AsapScience, a YouTube channel that reports scientific topics, cortisol levels peak between 8 and 9 a.m. For that reason, waking up and having coffee during that time can diminish the upshot, build a tolerance to the drug and affect how much cortisol is released in your system. There are other times throughout the day when cortisol levels peak, such as noon to 1 p.m. and between 5:30 to 6:30 p.m.
You might want to rethink ways to maximize your coffee benefits. Eating a healthy breakfast before consumption can help increase your energy and provide your body with nutrients it needs. While coffee does contribute more to the overall consumption in adults, carbonated soft drinks are second in leading caffeine consumption. Other products to be aware of include tea, energy drinks, energy shots and some fruit-flavored beverages. Learn to optimize your caffeine choices throughout the day. 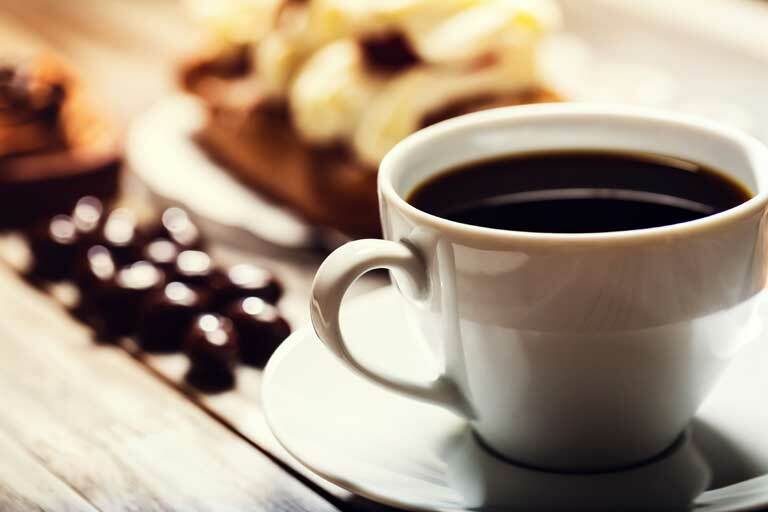 When looking for times to take your coffee break or drink a soda, schedule them from 10 a.m. to noon and 2 to 5 p.m. As great as a good ’ol cup of joe may seem first thing in the morning, consuming it at a better time may be more enjoyable in the end.